2 pieces of artisans work that go together plus a dress made just for this doll. It is about six inches long...the interior is covered in black leather, there are lovely wooden runners as well as a handle that is painted gold. 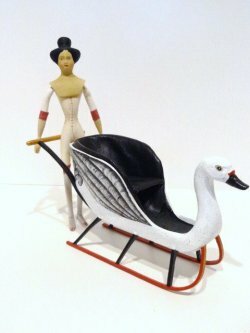 The swan's face is painted and feathers are painted on the back of the sled. A wonderful piece to match the beautiful Unity Doll that is marked "Millicent" on her head on the back and UFDC 2005 Tom Banwell.The head is poured and painted. Her body is carved of wood and then she has a white leather body over it stitched down the front, sides, and back. Also included is a blue pillow for the sled, a pretty "Costume for Millicent made for you" by the Sugarland Searchers Doll Club of Maryland, a hornbook, miniature La Semaine De Suzette magazine in miniature, and a padded box to tie the doll in.